Where on earth is the summer going? I was just thinking the other day it feels like it hasn't even got started yet, and then realised it's almost August Bank Holiday, which means that it's actually nearly over! I've been rather quiet on the blogging front lately, because I've been doing some overtime at work to pay off some of the car that I just bought. 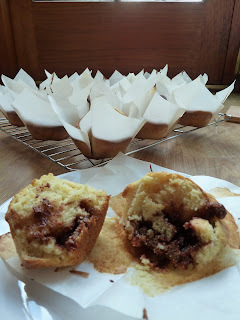 But I've still had time for baking, and so I'm just going to round up July in one fell swoop! I think these were actually all done in the space of a week, when I went on a bit of a baking frenzy. I ended up taking most of them to work to palm off, along with the last of the fruit cake from my Pink Whisk cake decorating course.